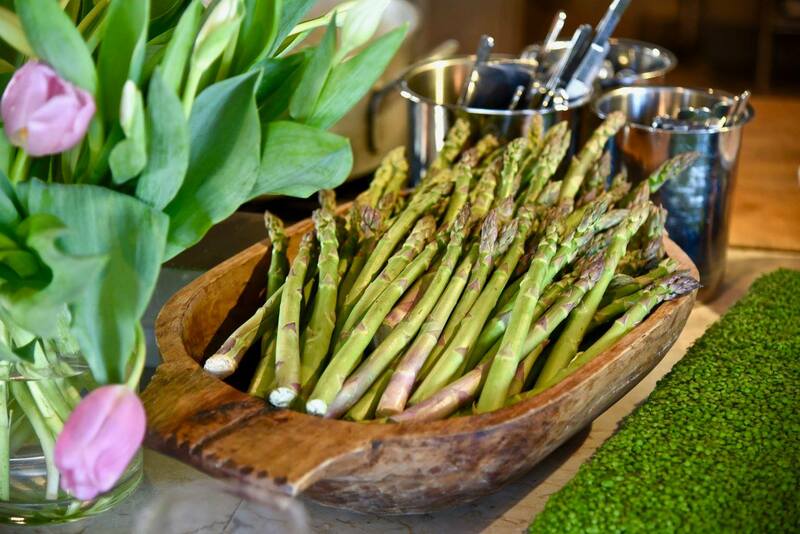 Chef’s Notes: Long prized as the King of Spring culinary delights, asparagus is the very embodiment of this wonderful season. Rising from the just warming soil, the young tender shoots embody our own waking from a cold winter slumber. Paired with another regal delicacy, Maine lobster, we offer the first course of our mid Spring menu. Lobster meat delicately folded into a cake and crispy fried set atop a rich Sauce Américaine and all topped with sweet and earthy California asparagus, it is certainly an honorable welcome to Spring. Chef’s Notes: In late Winter and early Spring, amongst the famous vineyards of the Napa Valley, wild mustard blooms in a fantastic blanket on the valley floor. As the bloom recedes, the true work horses of the vineyards begin their bloom… the humble fava bean. Used for centuries not only as a food item, but primarily as a nitrogen fixing cover crop, keeping the soil fertile over the long winter. As the tender young bean pod develops in Spring, the shucking begins. In honor of this we present our egg yolk ravioli filled with delicate fava bean custard, nestled atop a ragout of wild mushrooms with the crisp accent of sunchokes. It’s time for a taste of the Spring time fields. Chef’s Notes: Professional kitchens are an amazing landscape of cultural diversity; full of storied family recipes and culinary inspiration from around the world. One of our sous chefs, Eddie Torres, story stretches to Puerto Rico and the vibrant flavors his family cooks with. Taking inspiration from some of his mother’s cooking and mixing it with the local flavors of Spring, we have our next dish. Densely meaty Barramundi is pan roasted and sauced with an incredibly unctuous fennel sofrito. Throw green garlic and pigeon peas into the mix with the perfect foil of “bread and butter” spring onions, we have a dish that even Eddie’s mom would be proud of. Chef’s Notes: There are certain things that are just synonymous with Spring. Wild flowers, green hillsides, the hint of warmth in the air and for us chefs, Spring lamb; and when it comes to lamb, we look no farther than Martin Emigh and his amazing ranch. For three generations the Emighs have raised lamb on their ranch in Dixon, producing some of the most highly prized lamb in the culinary world, and it’s our pleasure to serve it to you. Spring lamb racks are slow roasted to succulent peak served over ash roasted Nantes carrots and a vibrant “tzatziki” of English peas and sorrel. Time to celebrate a local treasure. Chef’s Notes: One of the most interesting and inspiring times to cook are on the “shoulder seasons”. When Winter begins to loosen it’s cool grip and Spring breathes a bit of warmth across the fields, we can at times get some incredible combinations… and we got one. Late Winter huckleberries are paired with early rhubarb in a tangy and vibrant Spring stunner. Topped with a crunchy streusel and rich white chocolate Chantilly, we couldn’t think of a better way to say goodbye to Winter… and hello Spring! Bon Appetit!